Your car's defroster is needed to keep the inside of the windshield from icing up in cold weather. It can be a safety problem if the defroster is not working or quite uncomfortable if the vents are stuck in the defrost position. 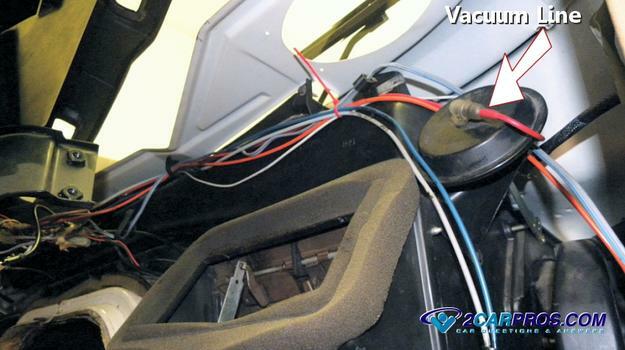 The defroster is part of the heater and air conditioner system which is housed inside of the heater plenum. The vent control system for the defroster in integrated into the operation of all temperature controls and uses forced air provided by the blower motor. On newer cars the vent direction and temperature controls are operated by a series of 3 or 4 electrical actuator motors which are adjusted by the climate control module. On older cars with manual controls these vent and temperature controls are operated by vacuum servos. Vacuum is provided by the engine while it is running. Heat, extreme cold and vibration of the engine and car's suspension can cause component of the defroster to fail. In some cases an electrical motor can burn out or the gears inside the actuator can break causing the defroster door to get stuck. A climate control system can stop working after a battery replacement as the control prompt of the system is lost and needs to be rebooted by removing the defroster/heater fuse for a period of time and then reinserted. 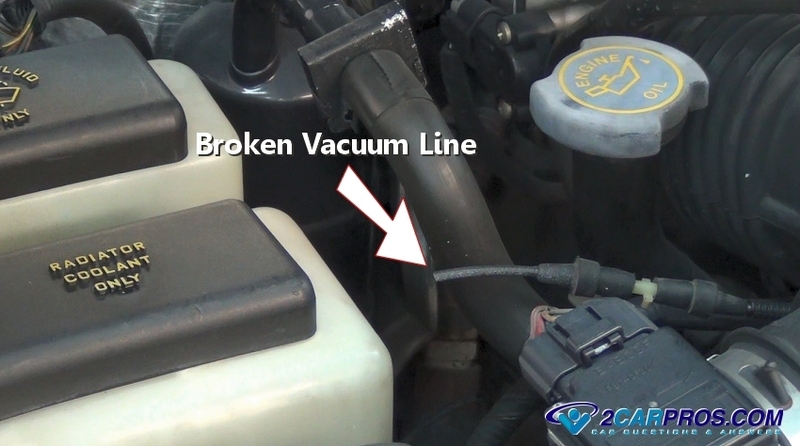 On older cars a vacuum line can crack allowing vacuum to escape rendering the vacuum vent control servos non-operative. A control switch on the dash can fall apart allowing the vacuum to escape and not reach the servos. A defroster can also fade when traveling up a hill but then return once the grade is overcome which is a signal the vacuum check valve has failed. If you are not sure which kind of system you have either vacuum or electronic any car made after about 1995 has an electronic system with no vacuum controlled vent door servos. We will go over the more modern system first. The climate system is responsible for controlling the position of the defroster actuator which is connected to the air position door in the heater plenum. This actuator controls defrost, middle and lower air vents. When it fails it can do so in the defrost position and must be replaced. Each car design is a little different but this guide on how to replace the defrost actuator will show you what you are in for when doing the job. If you need to know the location of the defrost actuator in your car please ask one of our online mechanics and they will get it for you. When the logic of the climate control gets confused it can lock up much like a desktop computer. This can happens due to a surge or spike in the cars electrical system. Before going too far with any repairs it can be a good idea to remove the climate control fuse and allow the system to power down. When the fuse is reinserted it will allow the system to reset and regain its logic and start working again. Locate the climate control or defroster fuse and remove it by using the owner's manual. This step is easy to do and doesn't cost you. The climate control computer is located in the panel itself and is subjected to moisture and vibration which can cause it to go out. Older models will have the controller somewhere under the dash which uses the control panel as a switching station. These systems must be tested separately using a wiring diagram. If you have an older car then the defroster system is controlled by using vacuum supplied by the engine. 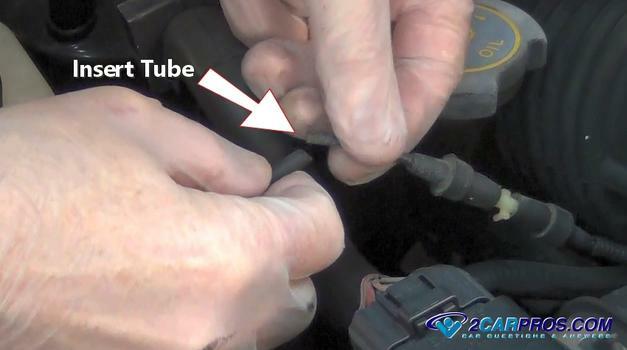 Lift the hood and inspect the vacuum hose or tube that leads from the intake manifold to the passenger's side firewall. 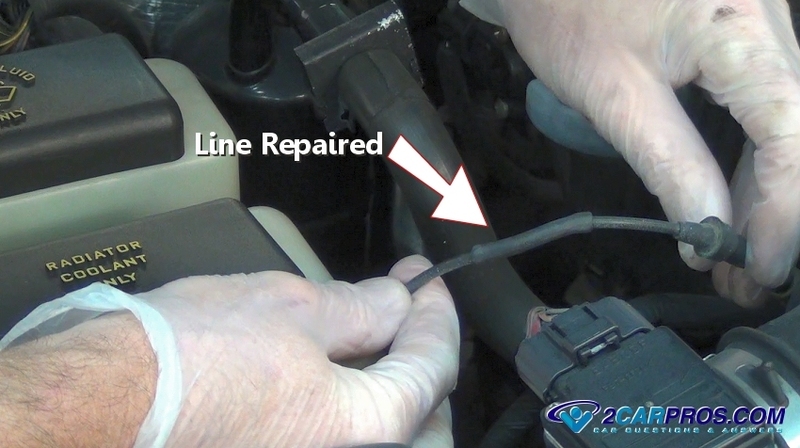 The image below shows a typical line break which causes the vents to stay in the defrost position. 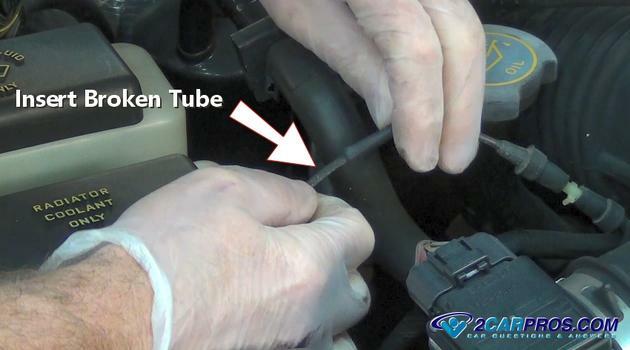 If a broken line is found use the rubber vacuum tube to insert it over the broken part of the plastic tube. Then locate the other end of the broken vacuum tube and insert in into the rubber line. After both ends have been inserted into the rubber line, double check for other line breaks. This is a common problem with defroster issues. Vacuum lines travel from the vacuum control switch on the dash to vacuum servos under the dash. These servos move the air doors which turn on and off the defroster. If you can hear a hissing sound when the car is running from under the dash then vacuum is escaping. This kind of system also uses a check valve which will allow the vent system to engage the defroster when travelling up a hill when engine vacuum is low. This is a sign that the check valve is bad and replacement is needed. If you have any defroster questions please visit our forum. If you need car repair advice, please ask our community of mechanics is happy to help you and it is always 100% free.